Participants: Nick de Bois MP, Mike Freer MP, Paul Maynard MP, Martin Vickers MP, John Lamont MSP, Mohammad Asghar AM, Keith Prince. 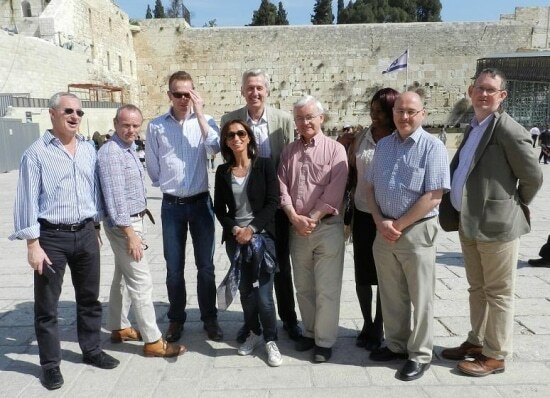 In February, CFI led a security orientated delegation of 4 Conservative MPs to Israel and the West Bank. Mike Freer MP, Nick de Bois MP, Paul Maynard MP and Martin Vickers MP were joined by a number of Conservative’s from regional and local level. These included, John Lamont MSP, the chief of the Conservative group in the Scottish Parliament, Mohammad Asghar AM, Conservative Shadow Minister for Culture in the Welsh Assembly and Keith Prince, the leader of Redbridge Council. The group had a first-hand opportunity to learn about and discuss Israel’s new political landscape following the previous month’s General Election. This included a cross-party round-table visit with newly elected MKs in the Knesset, a dinner with Dore Gold, Israel’s Ambassador to the UN, and former Deputy Foreign Minister Danny Ayalon. The group also heard a political briefing from David Horowitz, the founding editor of the Time of Israel current-affairs website. The delegation visited Sderot near the Gaza border, where they met with the Deputy Mayor to see the remains of rockets fired from Gaza, before receiving a briefing from the IDF at the Erez Crossing and a lookout over Gaza. The delegation also featured a visit to the Israeli settlement of Ma’ale Adumim and the E1 area of East Jerusalem to receive a briefing on settlement activity from a planning expert. The group also visited a football project in southern Israeli run by the Peres Center for Peace, which brings together young Arab and Jewish Israelis, as well as Palestinians. On a visit to the West Bank, the parliamentarians met with Palestinian business people for lunch and were given a tour of Rawabi, the first Palestinian-planed city in the West Bank. The itinerary also included a number of fact-finding visits, to the security barrier in Jerusalem to hear a briefing from its architect Danny Tirza, Yad Vashem Holocaust Memorial and the Old City of Jerusalem.